This year's SEMANTiCS is starting on September 12th with a full day of exciting and interesting satellite events. In 5 parallel tracks scientific and industrial workshops and tutorials are scheduled to provide a forum for groups of researchers and practitioners to discuss and learn about hot topics in Semantic Web research. 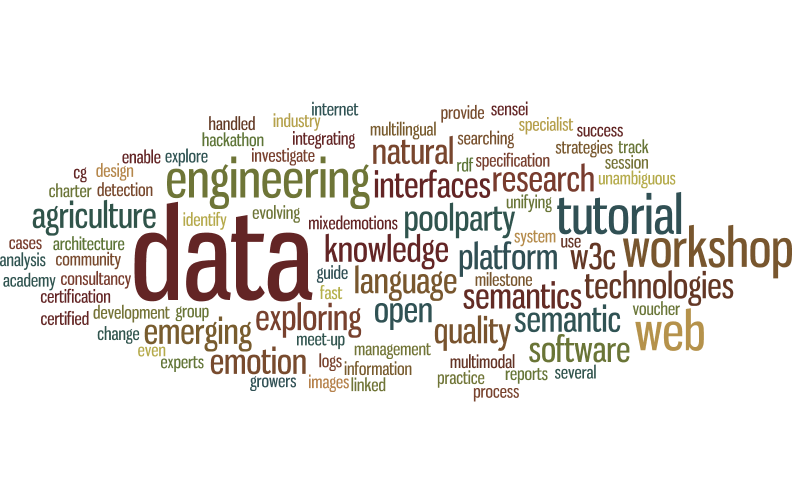 The word cloud above summarizes some of the highlights of this years SEMANTiCS satellite events. The scientific workshops are tackling topics such as Semantic Web and software engineering, semantic change and evolving semantics and Linked Open Data in agriculture. On top of that, tutorials on recent topics such as data quality, natural language interfaces on the web of data, emotion detection technologies and knowledge engineering using PoolParty offer great possibilities to expand on one's horizon. All workshops are free and there is no cost for attending. Free registration is mandatory as space is very limited.